Almost a year ago we hosted a Continuing Professional Development (CPD) session conducted by Porcelanosa Grupo. They presented one of their products – Krion – the new generation solid surface. Krion is a mineral compact material which is naturally antibacterial, and allows the creation of furniture without joints. Inspired by the CPD session, we decided to interview a specialist from Porcelanosa’s, read our article about Krion. In order to learn more about the Porcelanosa Grupo products and to further inspire and educate self-builders, we visited the company in Spain and toured their world class factories. If you are looking for inspiration for your Self Build interiors, especially in spaces such as bathrooms and kitchens, check out this visual blog – with our gallery and watch our video (taken from our Instagram story) along with some comments from Allan Corfield. Under the main Porcelanosa and Venis ranges, the company’s flagship product which they are world renowned for, is high quality porcelain and natural tiles. These range from the smallest handmade mosaics to large format 3.5m by 1.2m porcelain tiles. Again Porcelanosa can provide tiles for the smallest budgets right up to million pound 5 star hotel projects. During the factory tour we were shown the process from the source clay being fired and glazed, right through to the finished packaged materials that were ready to be shipped to the UK. As you can see from the photo gallery there are tiles and interior furnishings to match any type of project and budget. Under the Gamadecor brand at the Spanish HQ Porcelanosa Group, design, fabricate and then ship to the UK a range of stunning kitchens – for all budgets. At the bottom of the price bracket they can provide kitchens for large scale developer housing projects, then they have ranges to much the majority of self-build projects and then run right the way up to high-end kitchens topping £100,000! The kitchen units are fabricated from high-quality MDF and then finished either by hand, spray painted or with porcelain tiles. 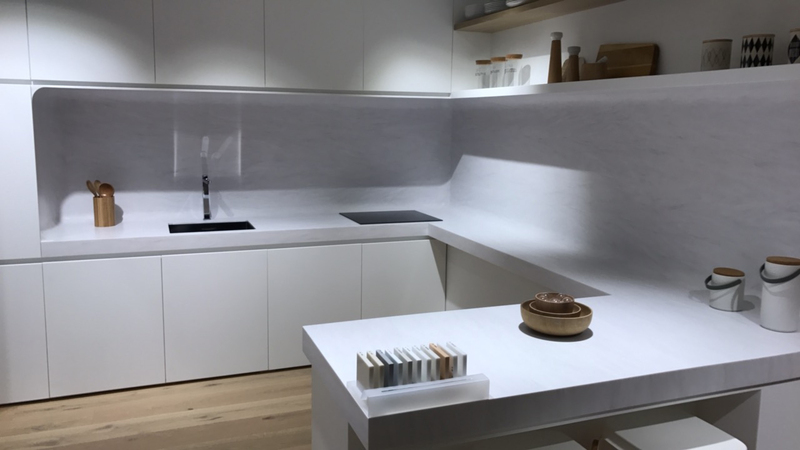 They have a vast array of worktop options to meet all budgets topping out at their very own Krion work surface that can be curved and formed to make any shape, without physical joints. As you can see from the photo gallery they have styles and materials to match all self-builds whether traditional or ultra-contemporary. Under the Noken brand, Porcelanosa can again provide bathroom designs for all budgets not only just high-end show homes. More and more commercial developers are starting to use Noken in their mass housing schemes across the UK. As well as seeing the basic range of bathroom furniture we were shown the companies collaborations with some of the world’s top architects, ranging from Lord Norman Foster to the late Zaha Hadid. These collaborations have created stunning bathrooms which will be specified in some of the top one off homes and hotels throughout the world. Krion is extensively used in all ranges due to its versatility and being able to be moulded into any shape, creating seamless interiors that can have integrated back lights, with no visible joints! We would like to thank Porcelanosa Grupo for their invitation and hospitality during our visit to their factories. If you feel inspired by their designs and would like to apply them in your Self Build project – visit Porcelanosa’s website and contact their specialists to discuss the solutions.